WESTBRIDGE STATION: Shelter shed opened: 6/28/16, with ticker office at street level. 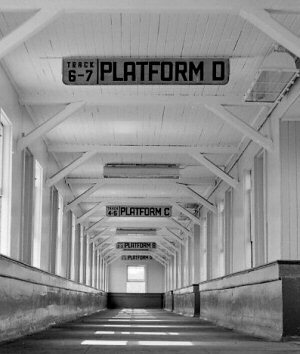 Out of service 1/01/39 and discontinued as station stop. 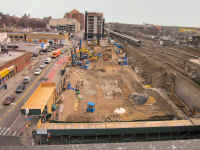 Westbridge Station - Construction of BRT trestle. View W showing the girder trestle of the Jamaica Ave. BRT EL under construction on 12/11/1916. The G5's 39-50, delivered in 1929-30, came with these Lines West tenders. 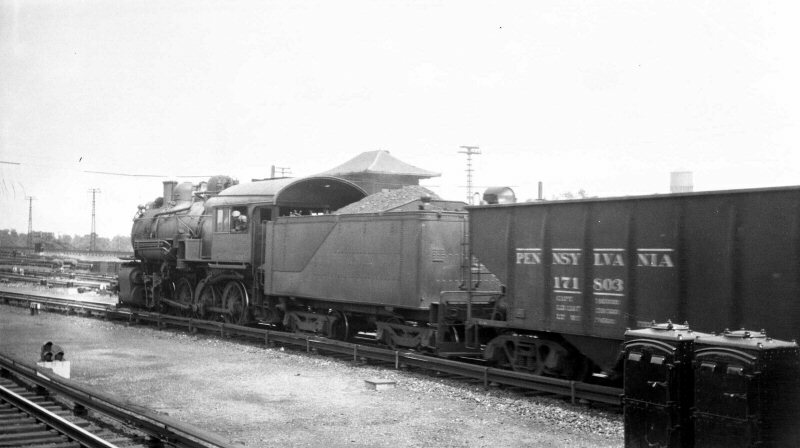 The rear truck front axle has roller bearings for ASC. 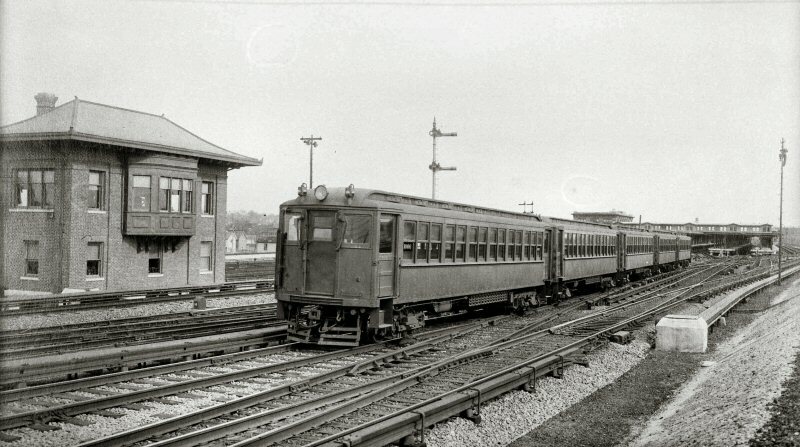 The passenger car and MU car at the left is in the Tichy scheme (11/01/49) with ASC installed below engineer cab window. 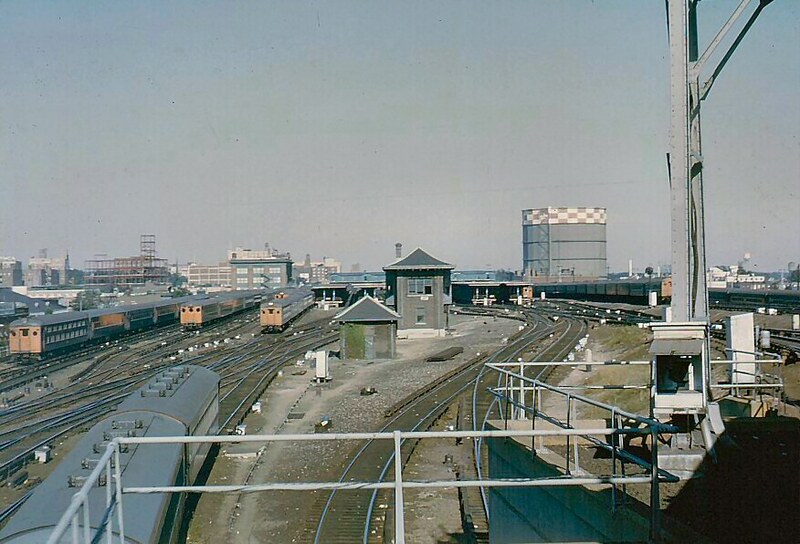 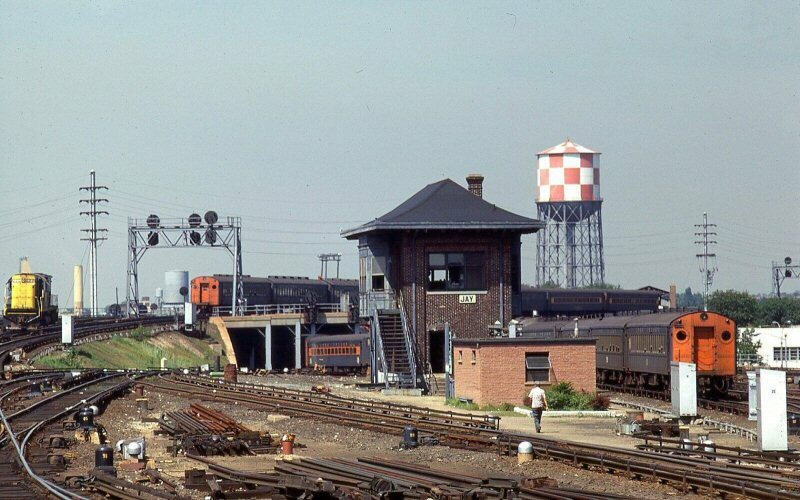 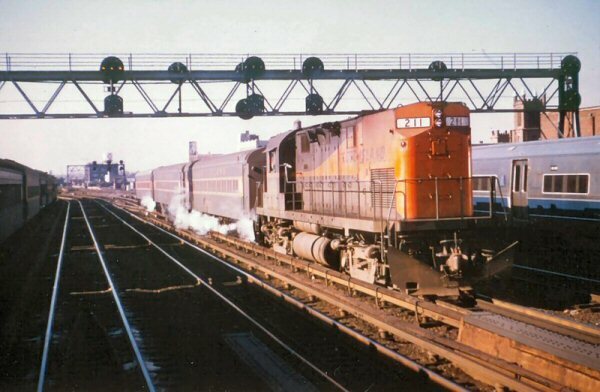 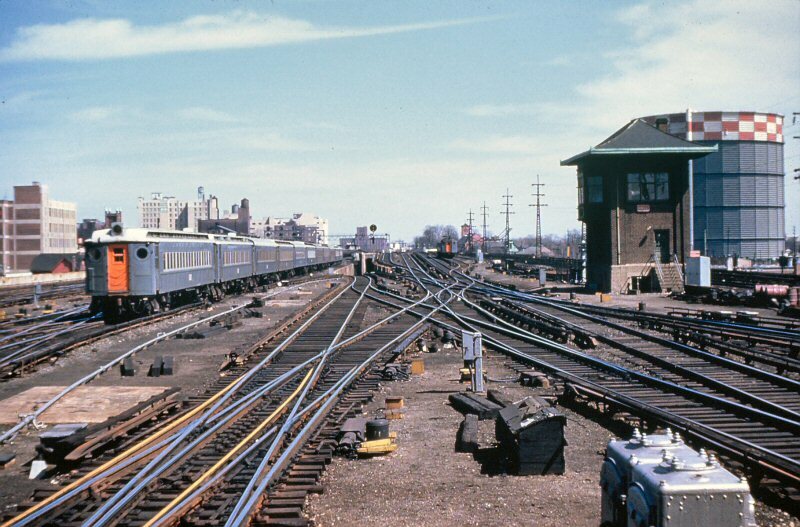 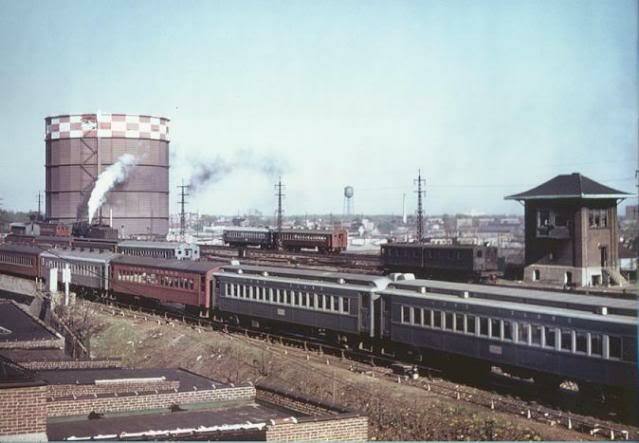 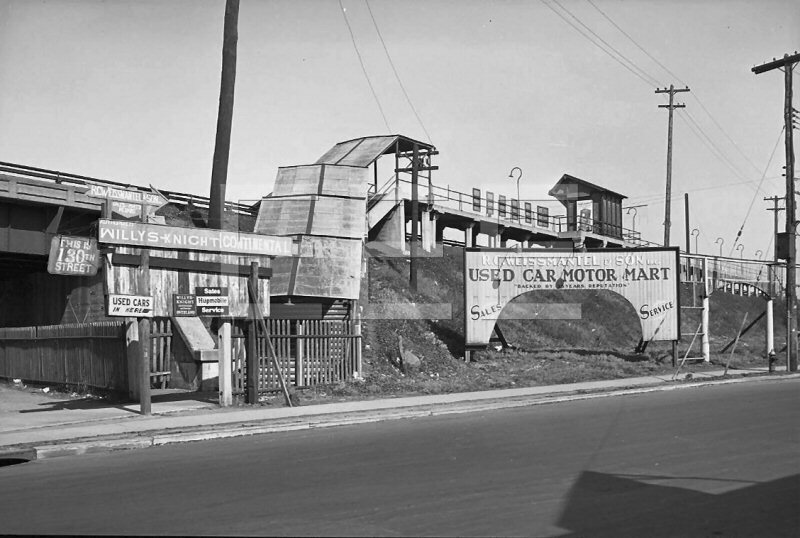 View east at Hall Tower 03/27/1954 of a string of Tichy-schemed cars with orange end doors for better visibility at grade-crossings. 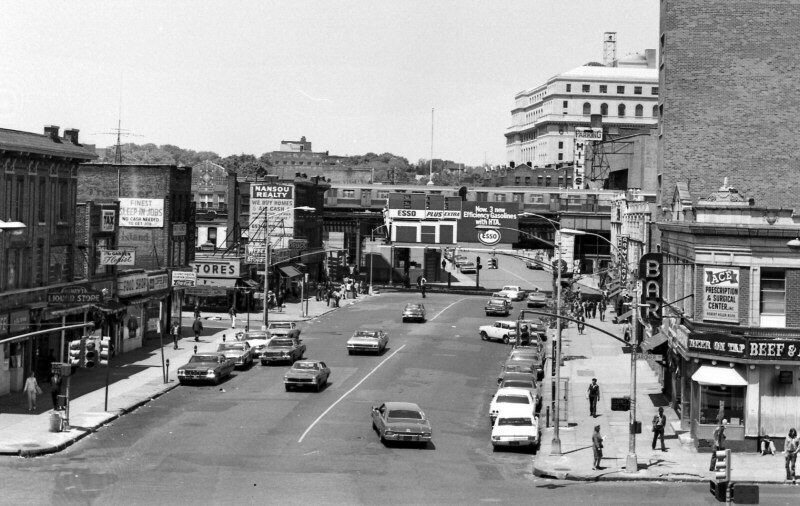 JAY Tower view W in 1969. 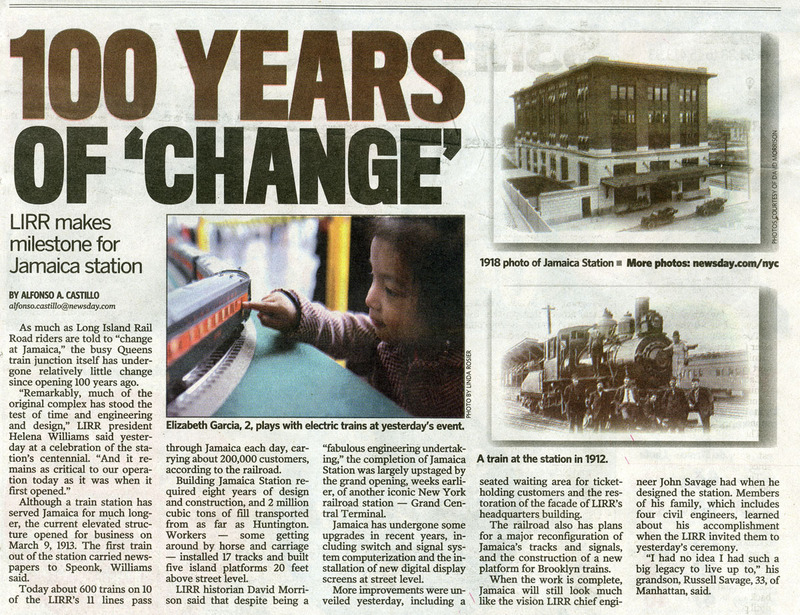 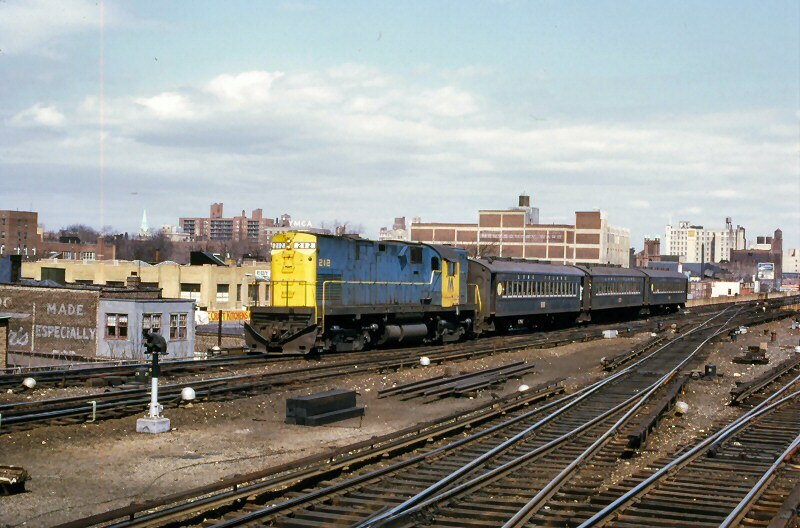 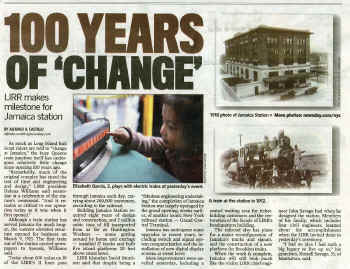 A brand-new C420 at the far left in original yellow and pale blue MTA colors (delivered the summer of 1968)! 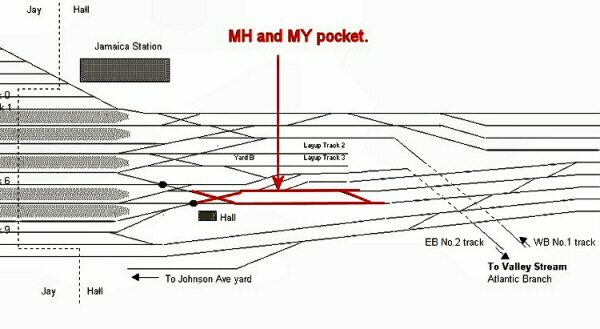 Notes: The black canisters with the yellow numbers are for the switch machines. 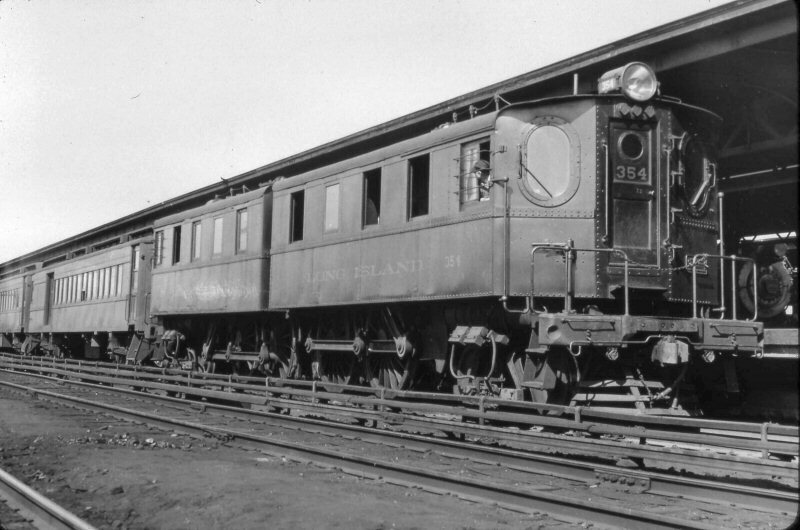 The yellow numbers are to identify the various switch numbers. 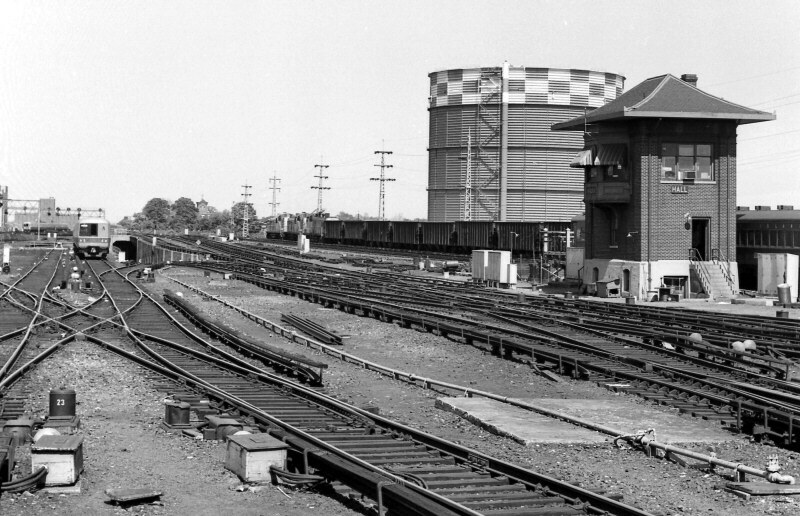 The canisters themselves are the exterior covers for the electropneumatic components that operate the switch. 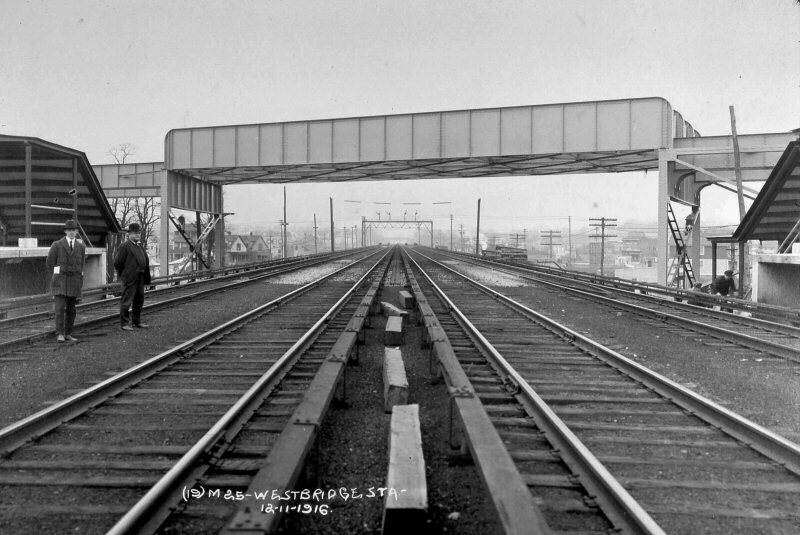 The white 'pothead' covers, made of cast cement adjacent to the third rails, cover the terminals for the third rail cable connections. The ones semi center, not near the third rail, are for a sectionalizing switch. 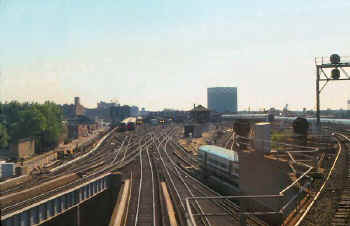 JAY Tower view W in 1998. LIRR M1 #9754 westbound on its journey to LI City. 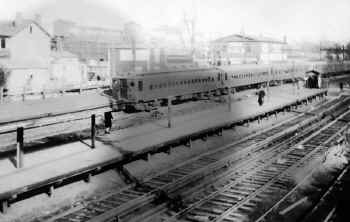 All images following are courtesy of the Dave Keller Archive unless noted otherwise. 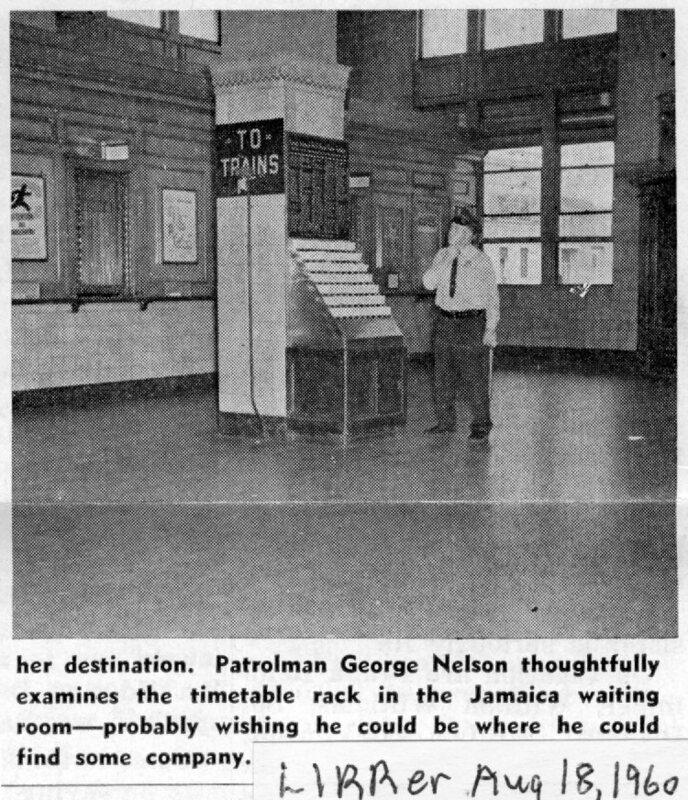 All captions are by Dave Keller. 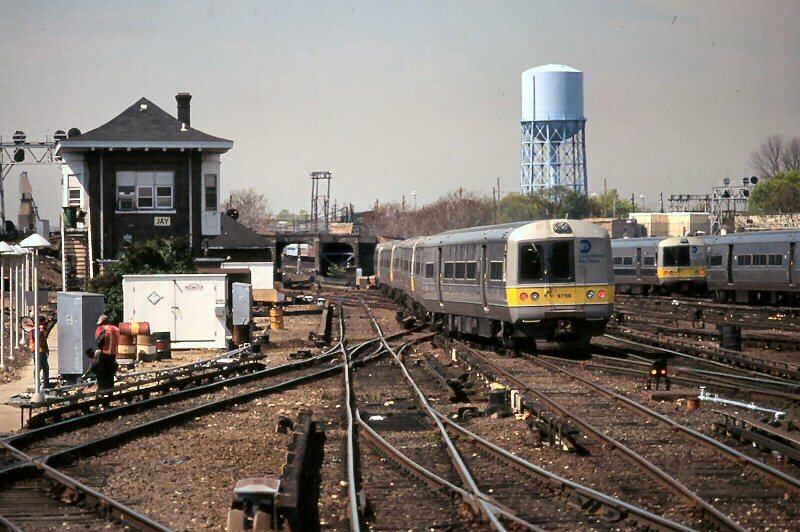 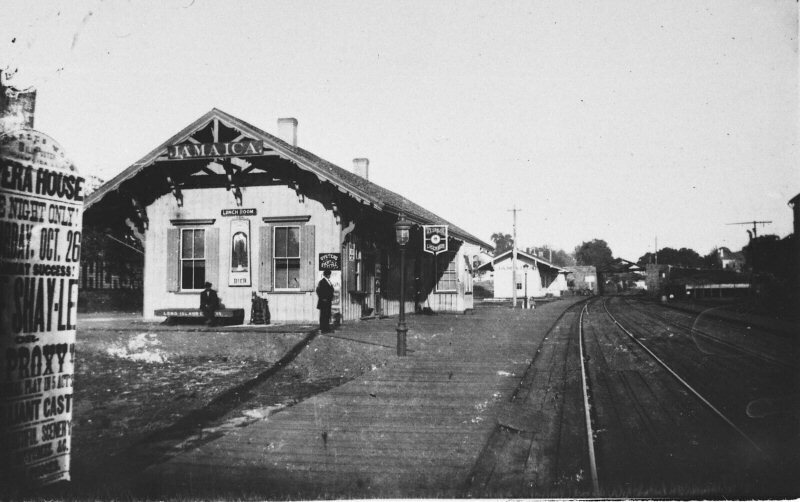 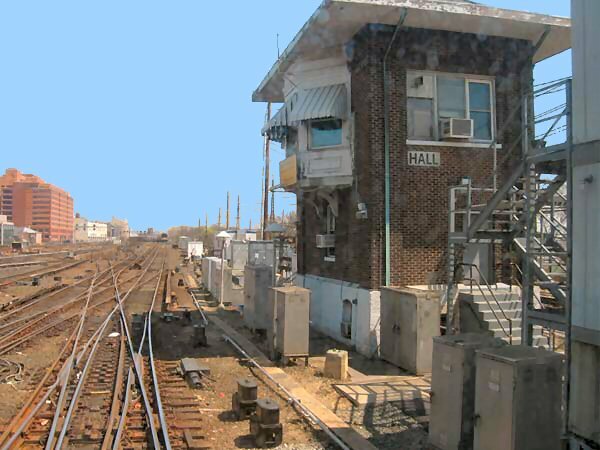 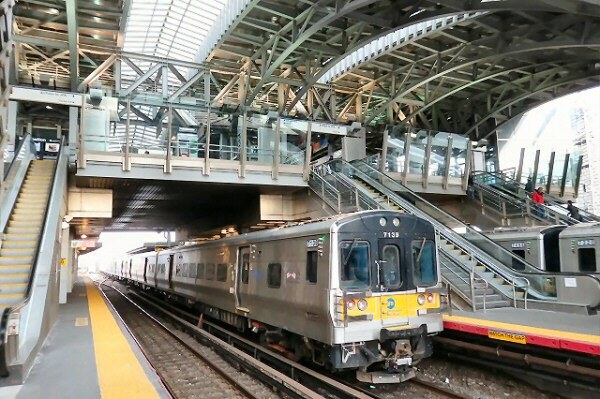 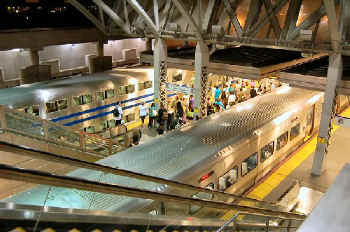 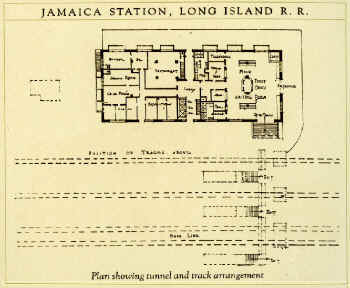 The SSRR’s larger Jamaica depot in use on LIRR property. 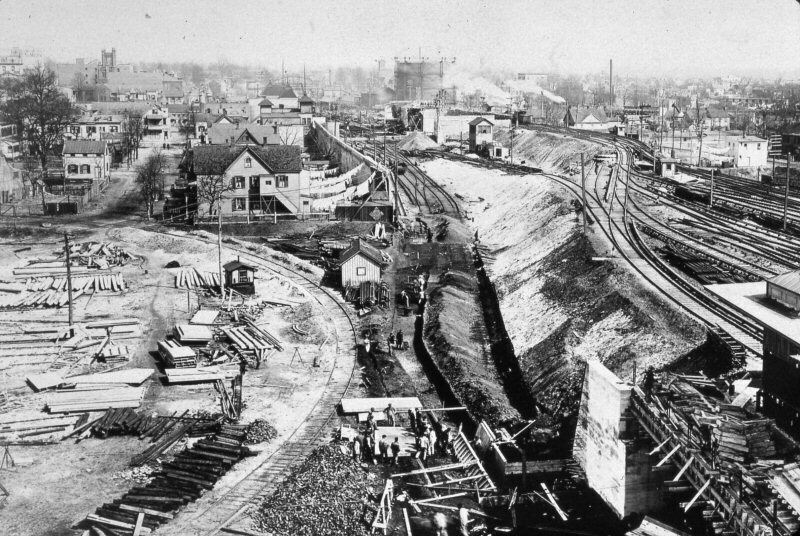 View looking northeast c. 1880. 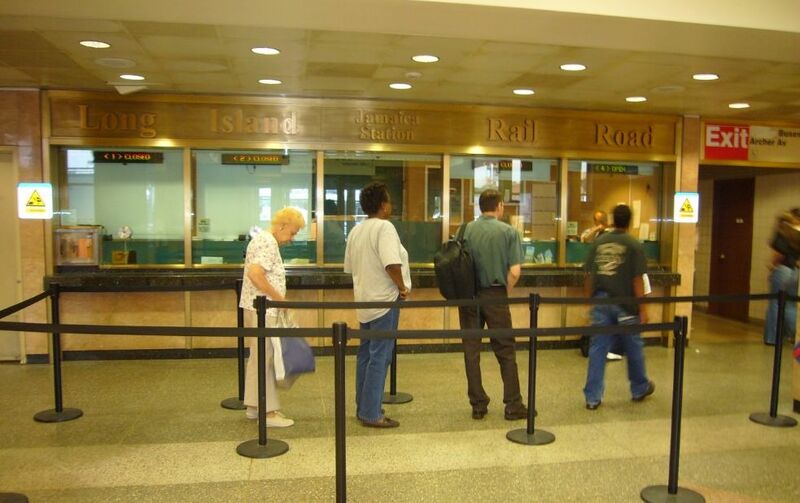 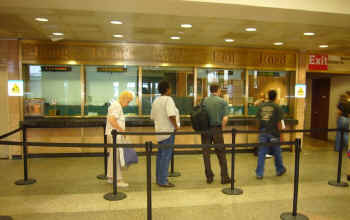 This shows better the demarcation between ticket office/waiting room and lunch counter/bar. 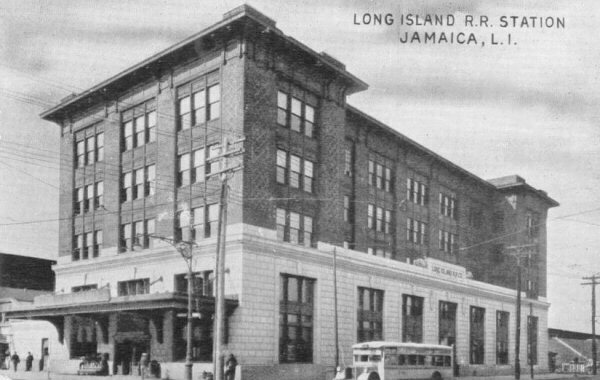 There are a number of LIRR crewmen relaxing in front of the building, noticeably the bar portion! 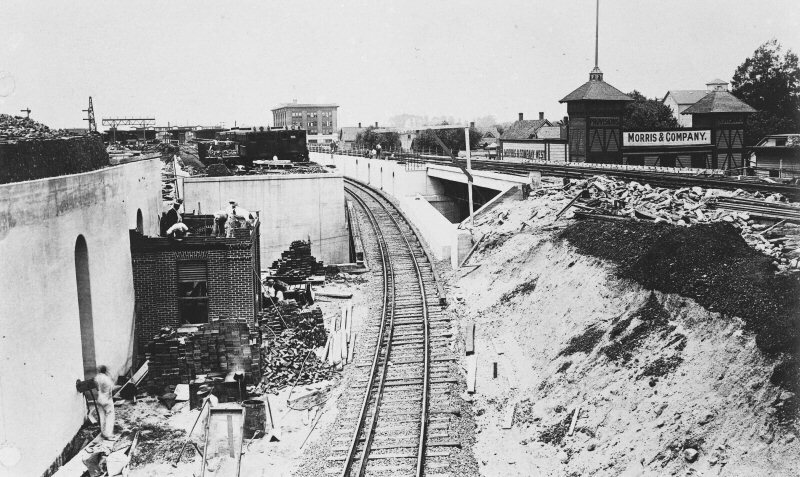 Both photos ()left and below) were taken from the Prospect St. overpass (old street name), looking west. 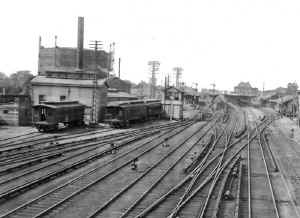 The tracks were in a cut from here eastward. 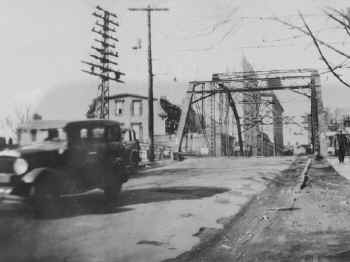 The ROW was crossed by a number of iron bridges. 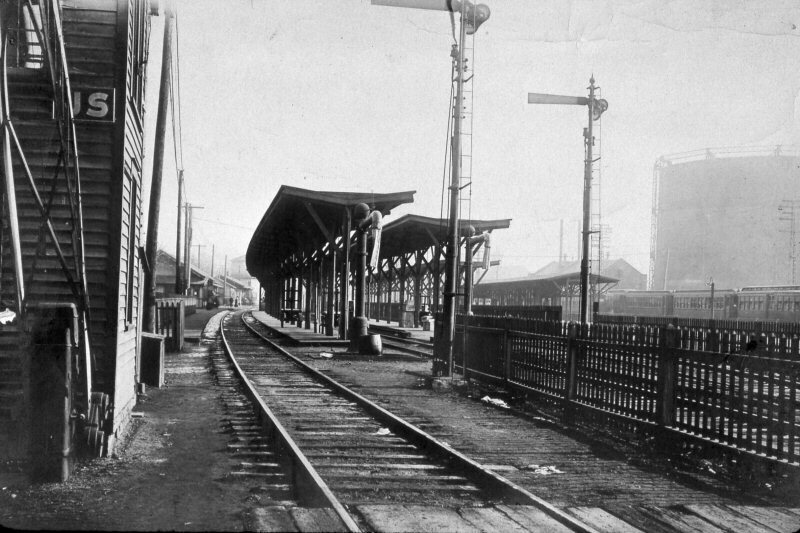 The Beaver Street crossing is not evident between the overpass and the station. 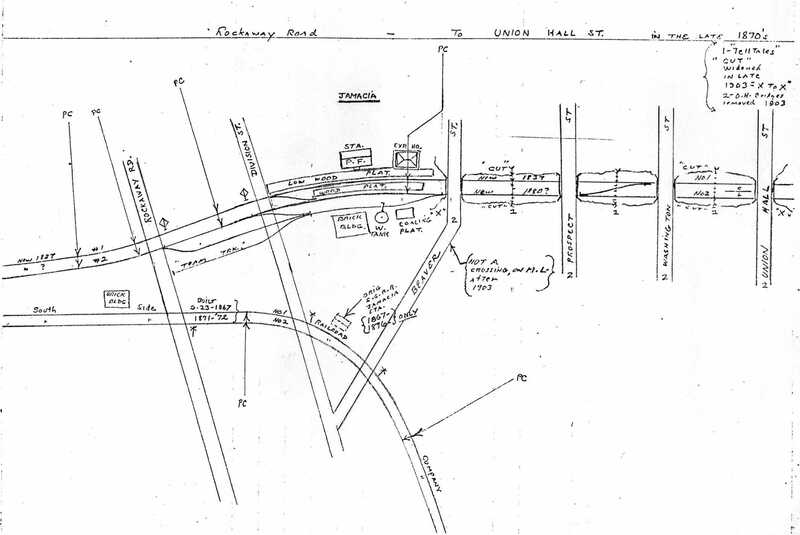 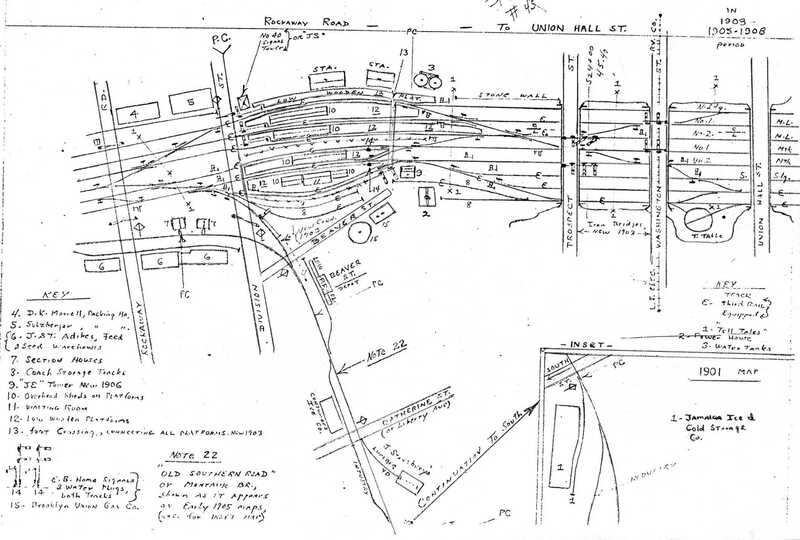 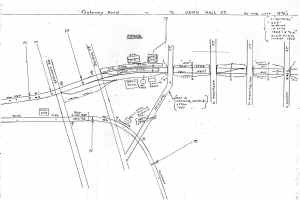 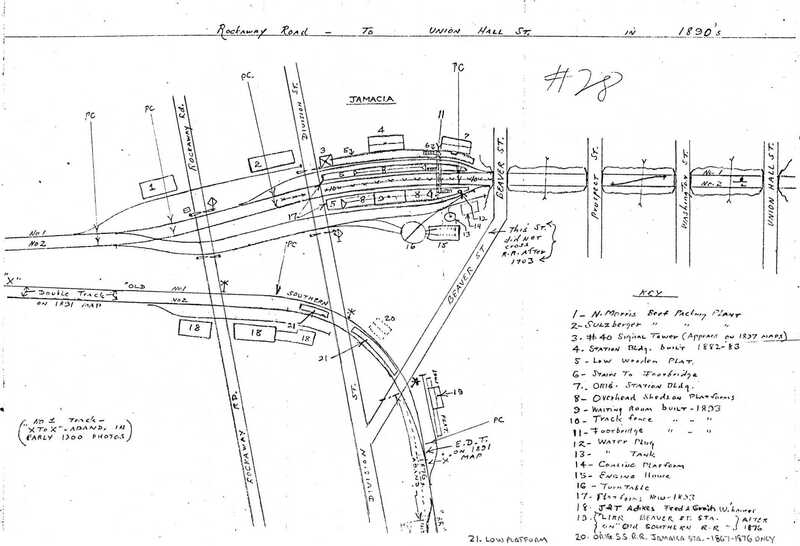 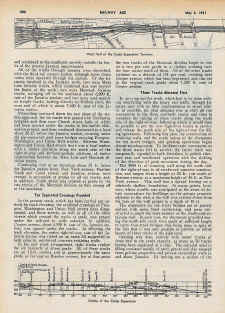 Emery's map indicates that the Beaver St. crossing was taken out after 1903. 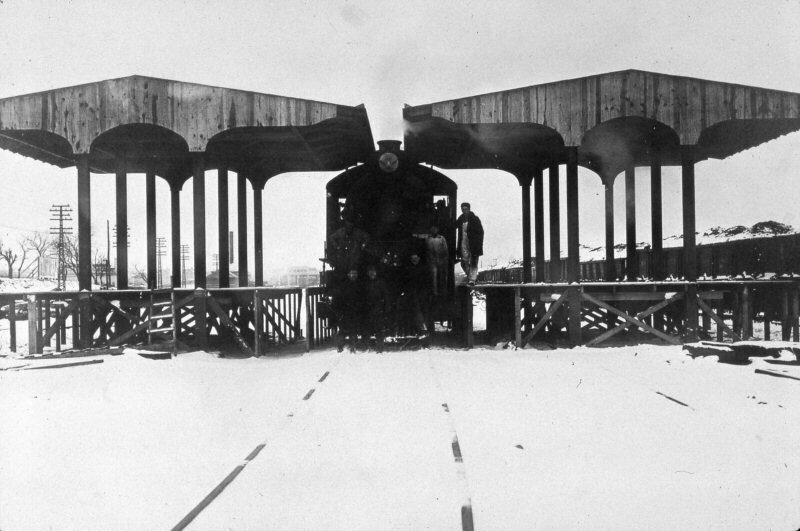 So . . we know both images were photographed AFTER 1903. 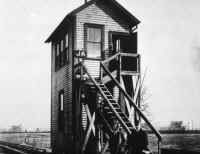 This was photographed sometime between 1903 and the "in-service" date of 1906 of Tower 41 (2nd). 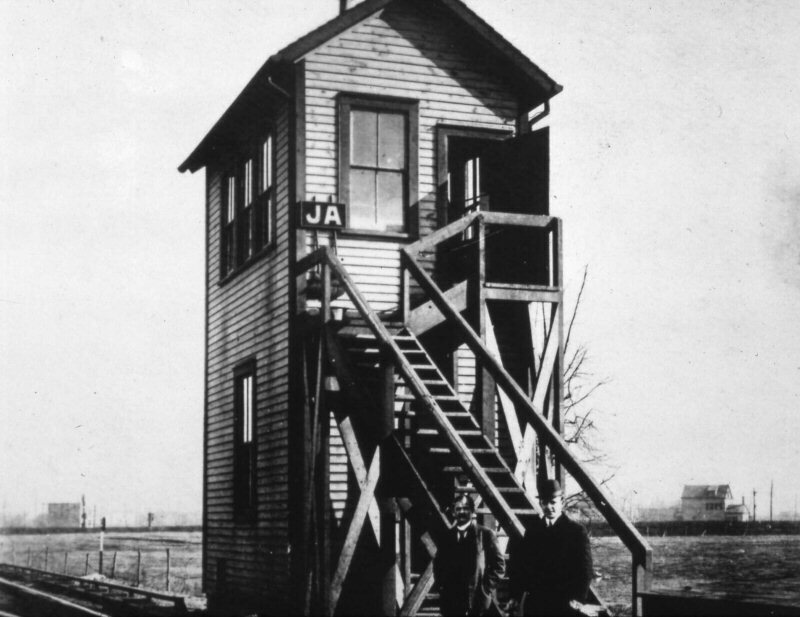 Archive: Dave Keller The interlocking tower in this photo is "JE" tower which was originally numbered Tower 41 (2nd), placed in service 06/29/1906 and renamed with call letters in 1907. 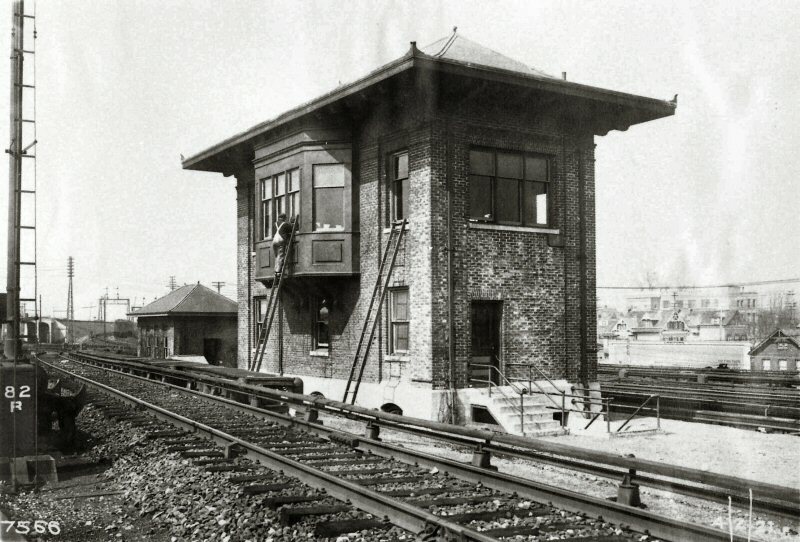 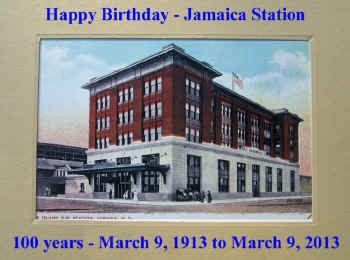 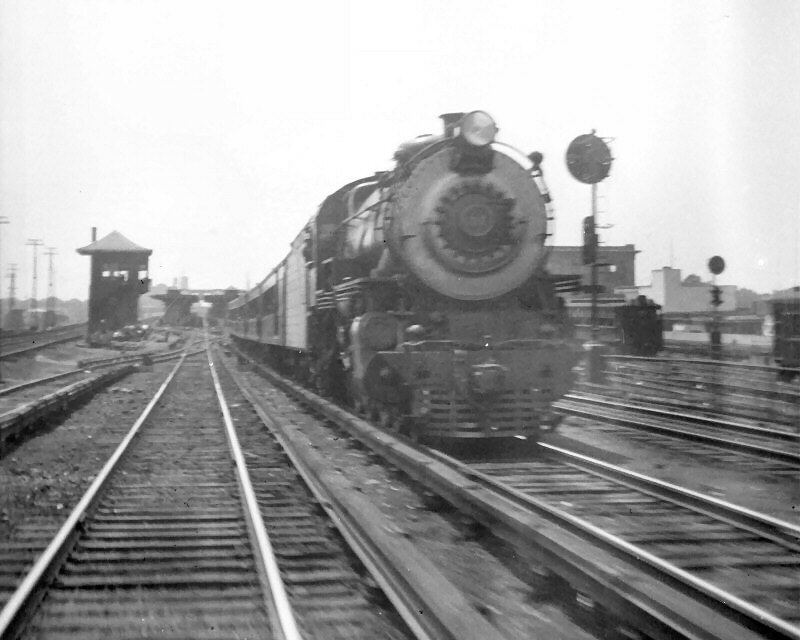 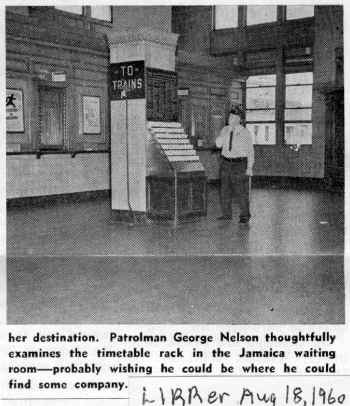 The tower remained in service until it was demolished in the 1913 grade elimination/Jamaica Station elevation project. 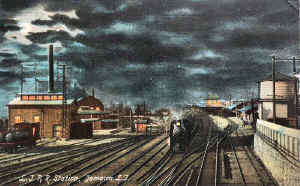 G53 (4-6-0) #135 pulling freight east through the grade elimination construction near the site of the old station facilities. 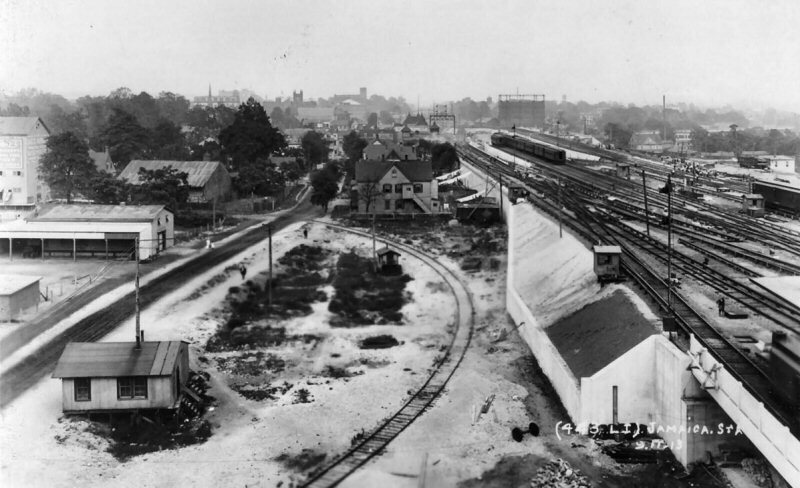 View looking northwest – 1913. 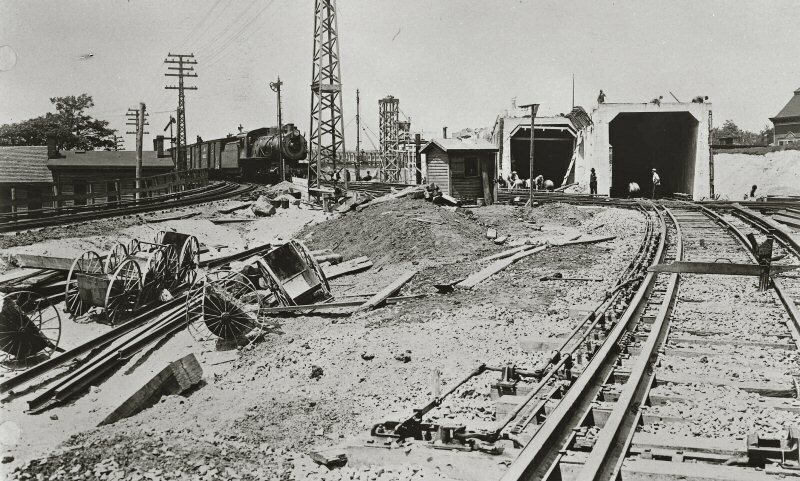 The tunnels are for the Old Southern Road tracks to head southeast. 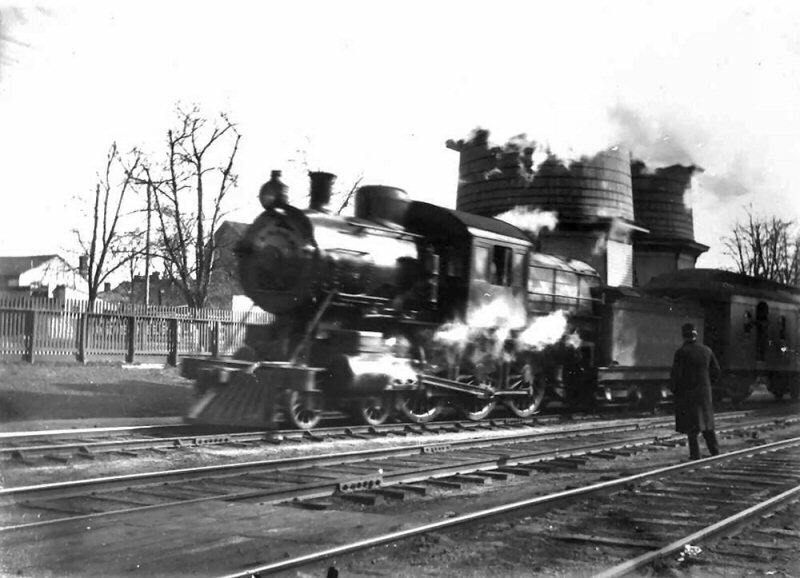 Note the brakeman riding the top of the lead car. 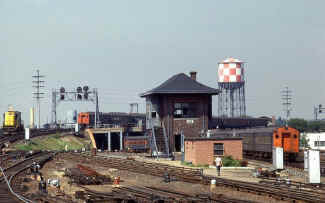 Track gauge spacer is in place in the foreground. 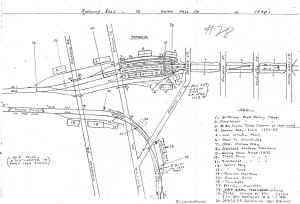 The 3rd, inner rail on the curve was to keep derailments at a minimum. 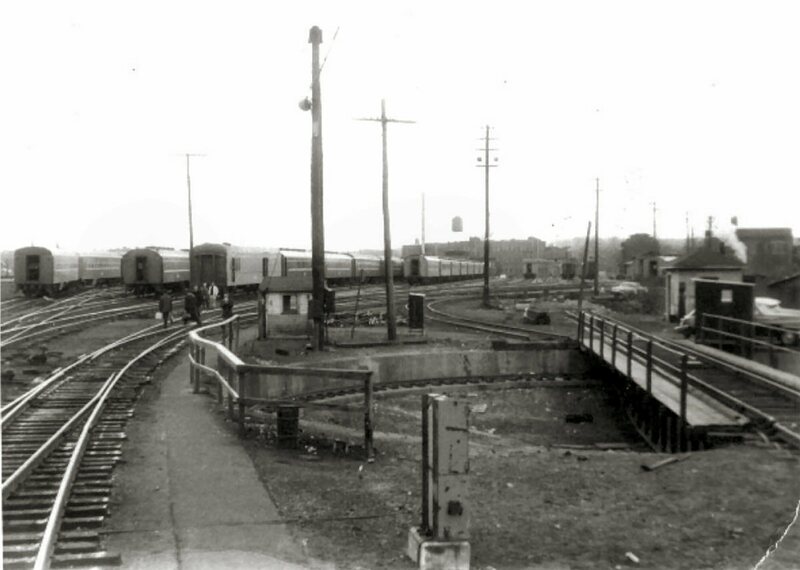 At the left foreground are the old hand-drawn concrete wagons. 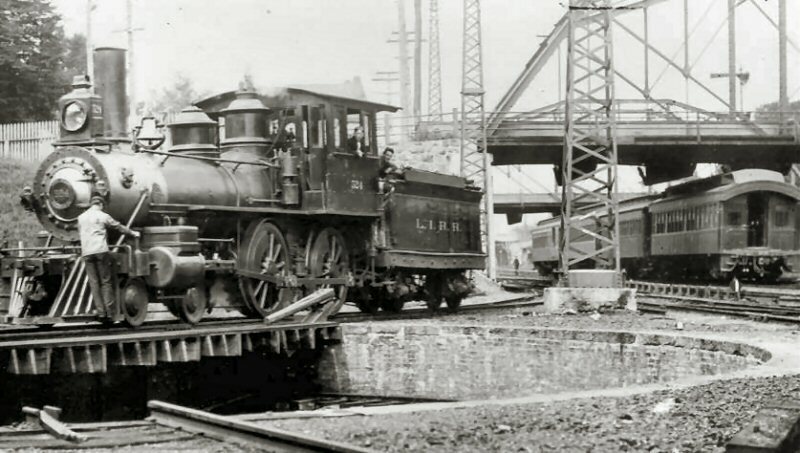 The laborers on this project didn’t have it easy by any means! 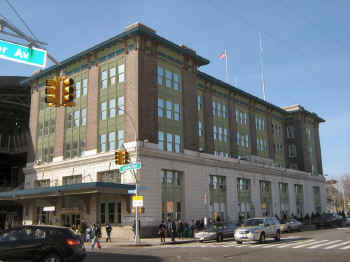 New Jamaica station general offices nearing completion. 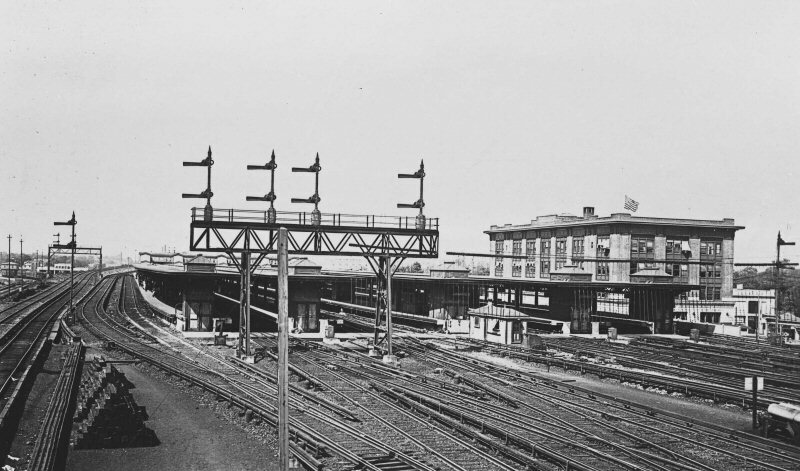 View NE from platform roof – 1913. Note the barren-ness of Jamaica in the background. 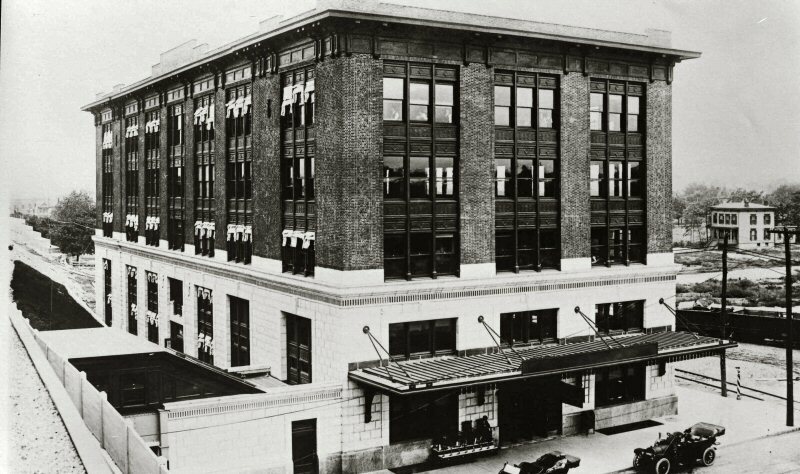 Also note the folding fabric awnings over many of the office windows. 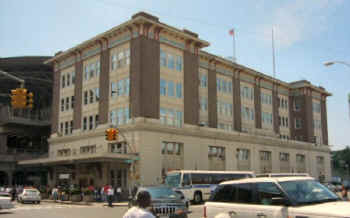 New Jamaica station general offices nearing completion. 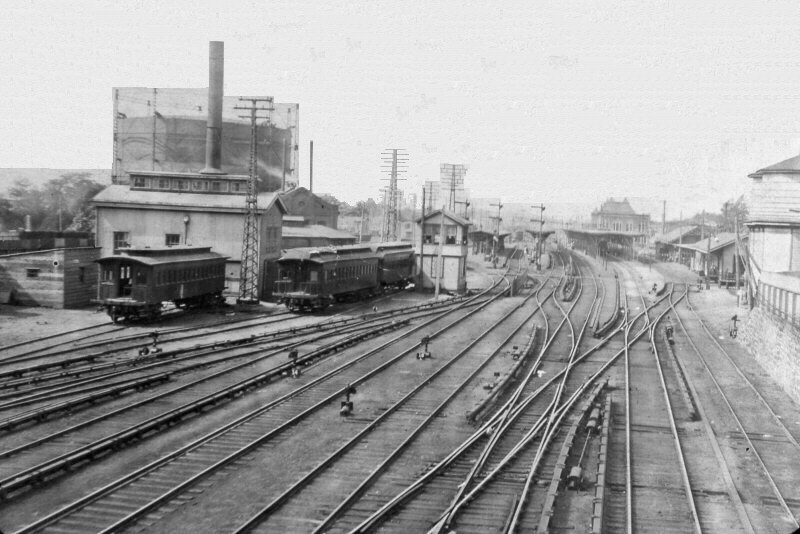 View NW from tracks – 1913. 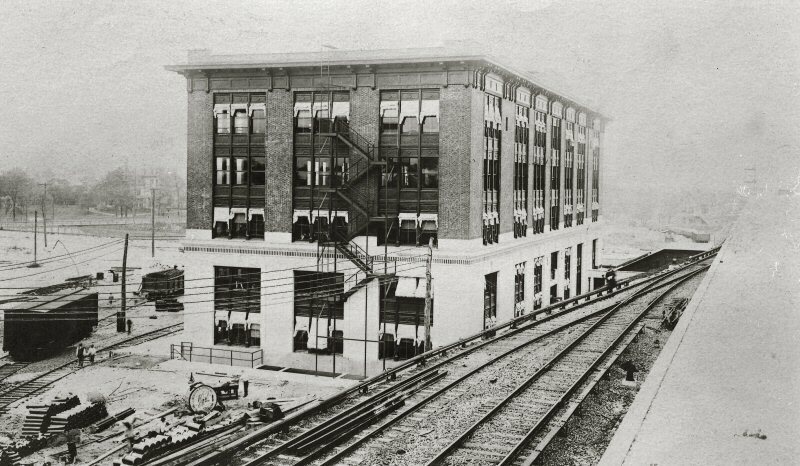 Note the folding fabric awnings over many of the office windows in this view as well. 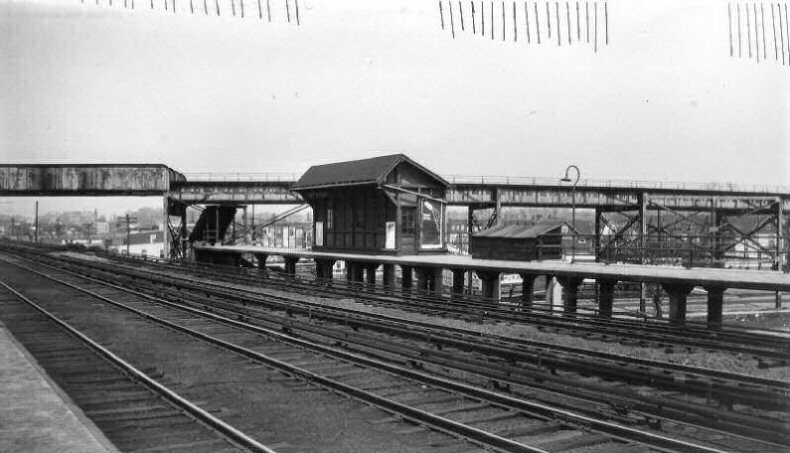 New Jamaica station and platforms at track level as viewed from the new “JE” (later “HALL”) tower. 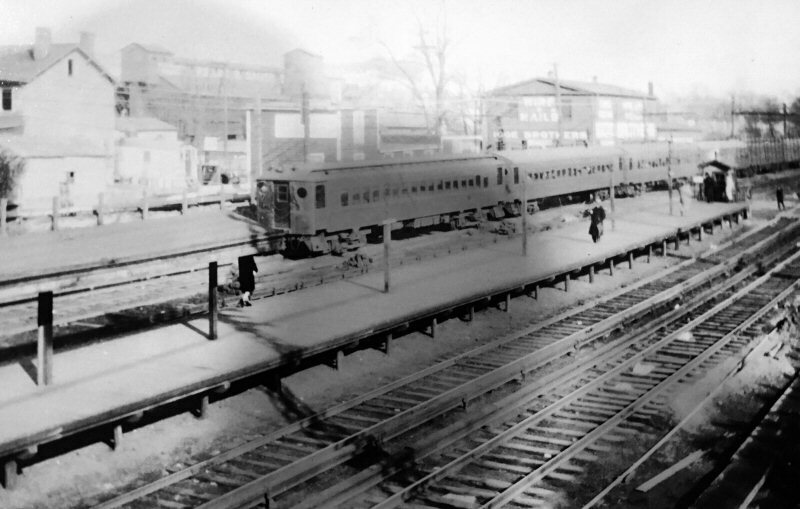 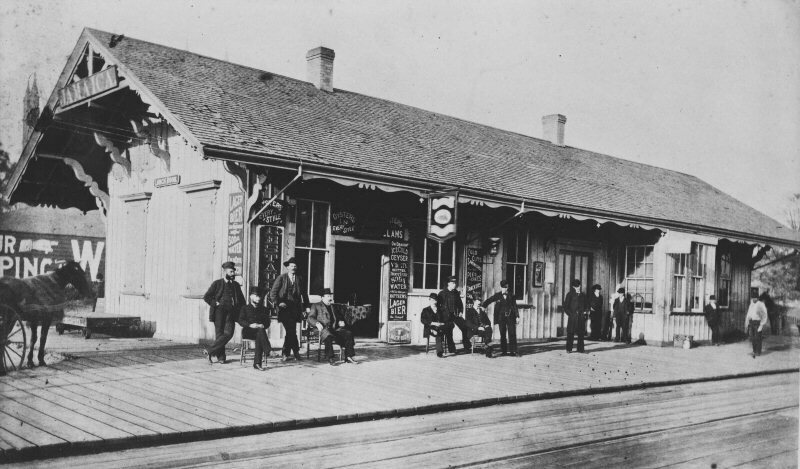 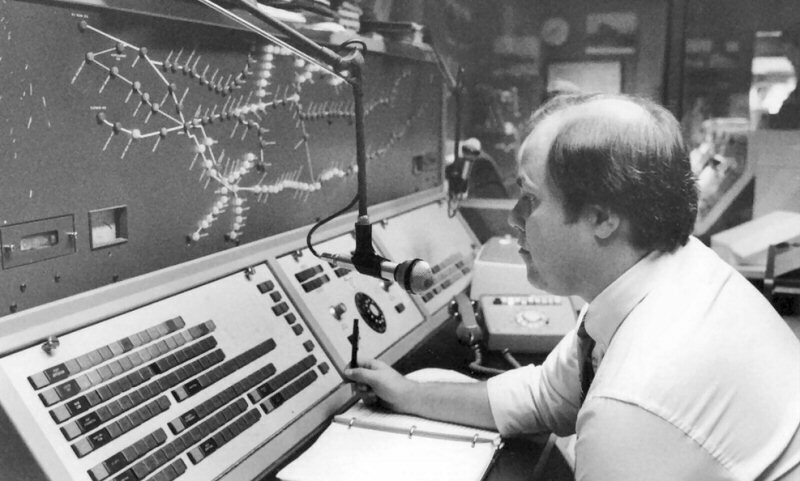 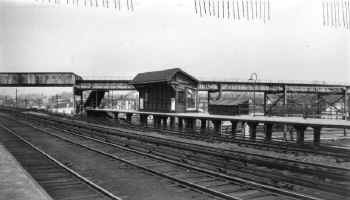 Note the signal bridge over tracks 6 and 7, which was removed some years later. 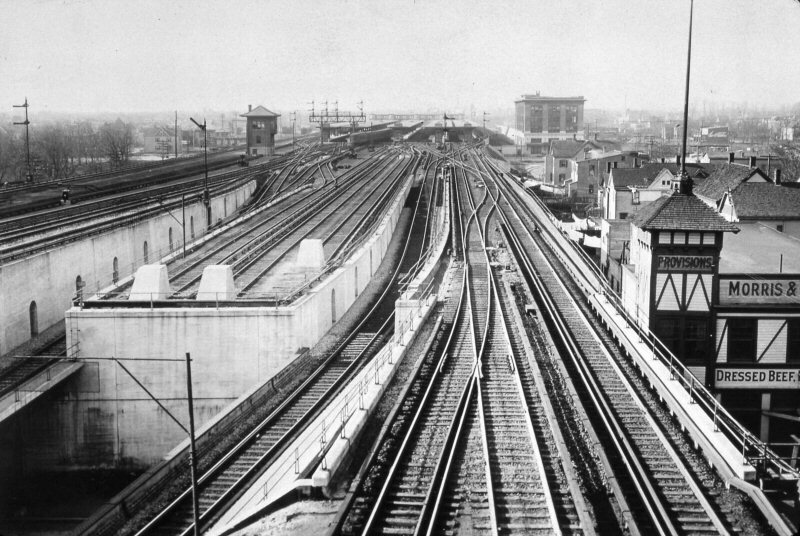 View is NW – 1913. 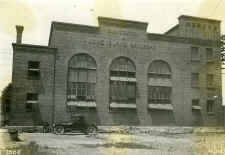 This MAY be a photo on or in preparation of opening day, judging by the U.S. 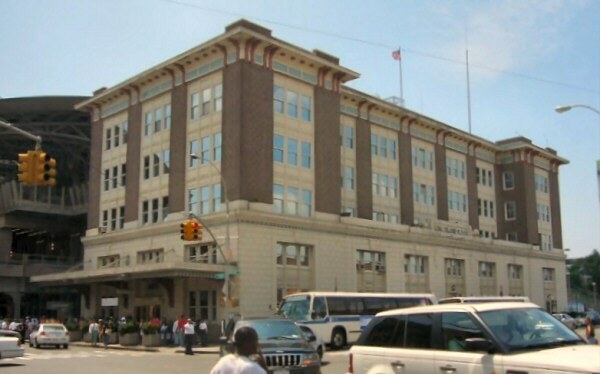 Flag flying from the roof of the general offices. 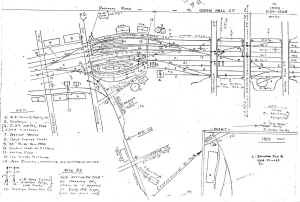 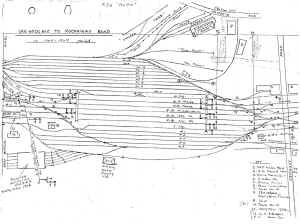 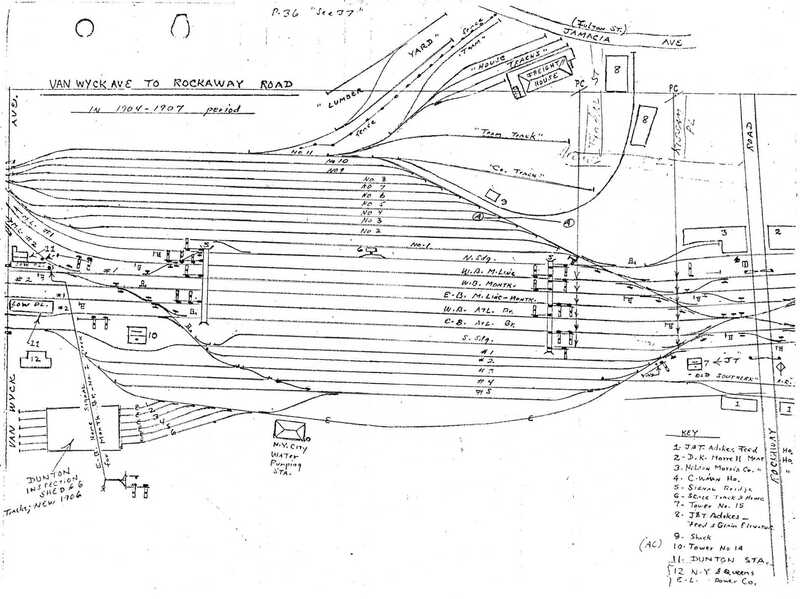 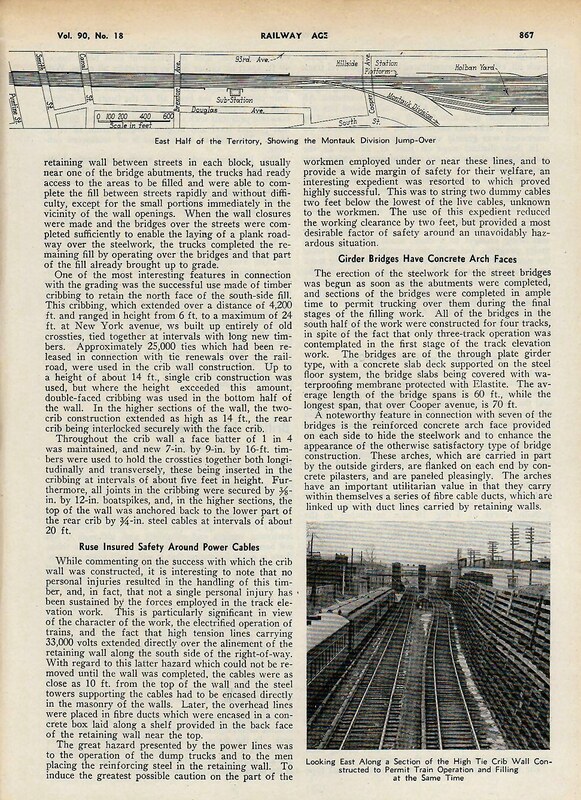 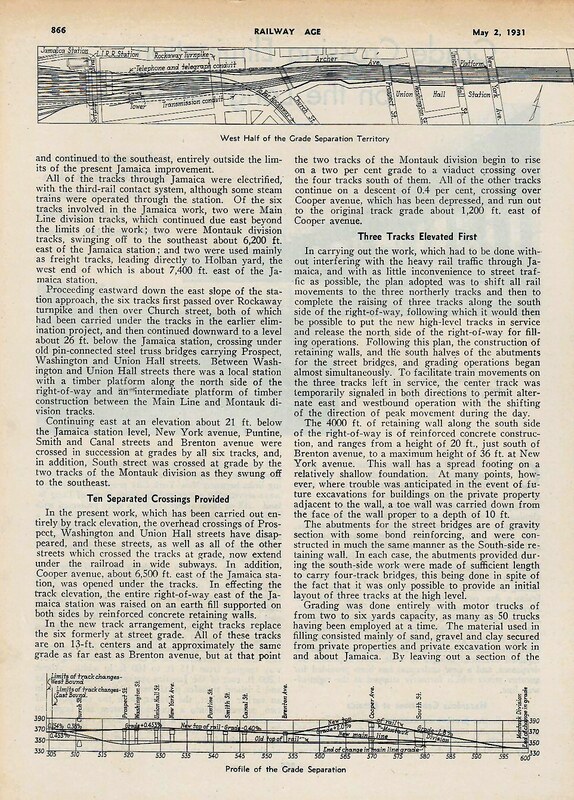 Note the tell-tales in the center of the image on the westbound tracks, to protect men riding on top of cars/equipment making reverse moves eastbound with the new tunnels in such close proximity. 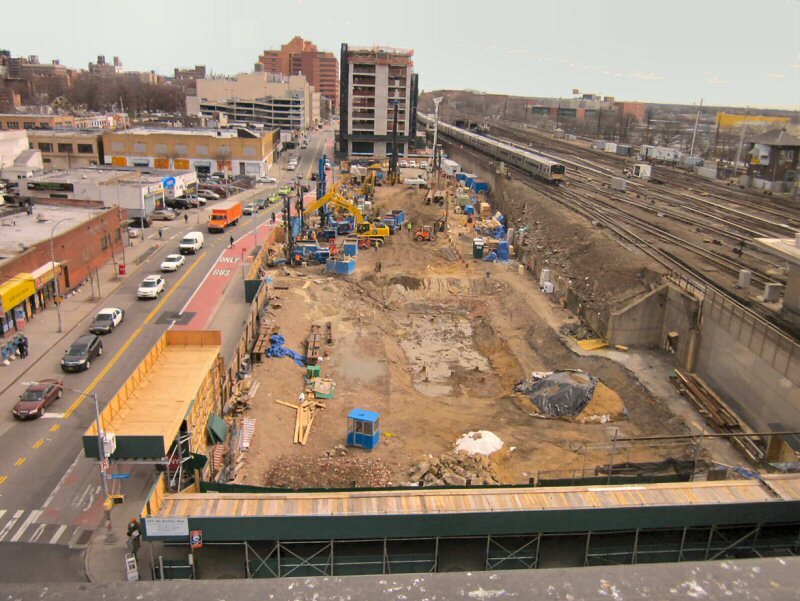 Grade elimination west of the new depot, looking east from the west side of Van Wyck Avenue – 3-10-13. 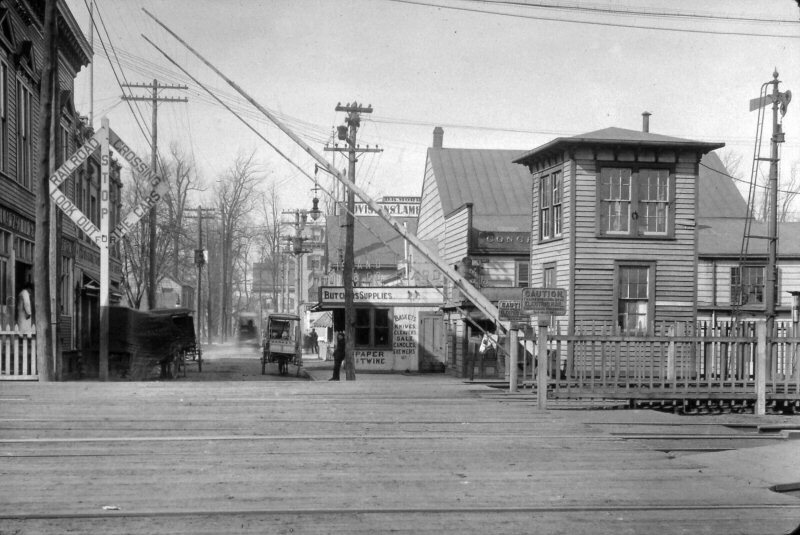 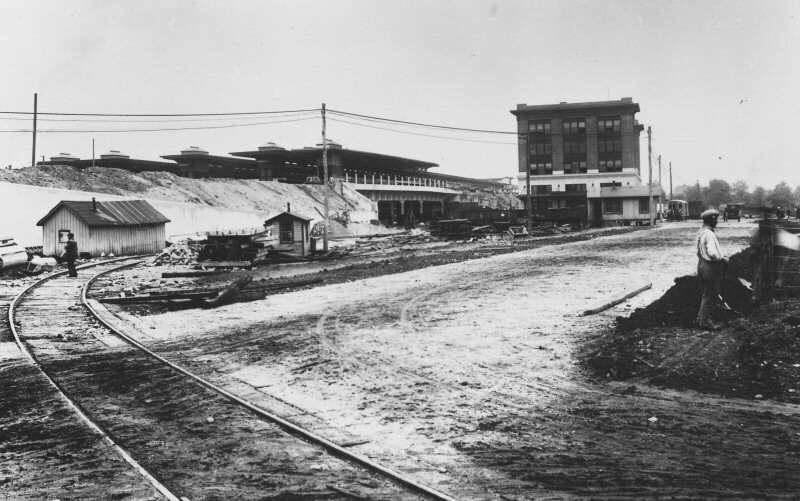 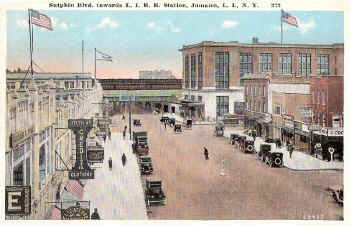 The superstructure over the avenue is in place in the right background and in the right background can be seen the Dunton Electric Car Shop, which 1906 building was located on the east side of Van Wyck Ave., south of the LIRR’s tracks. 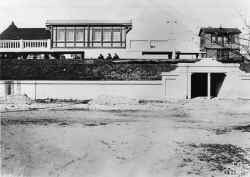 It’s quite evident this was a very LONG structure. 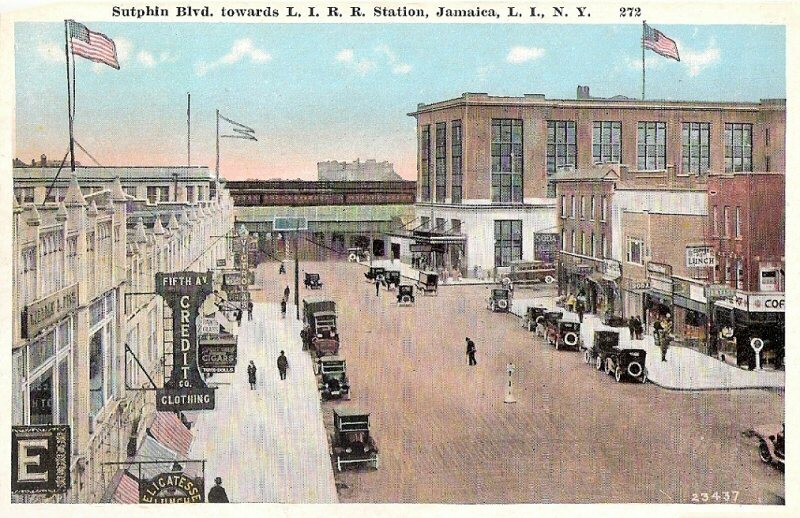 Post grade elimination work at site of old Jamaica station. 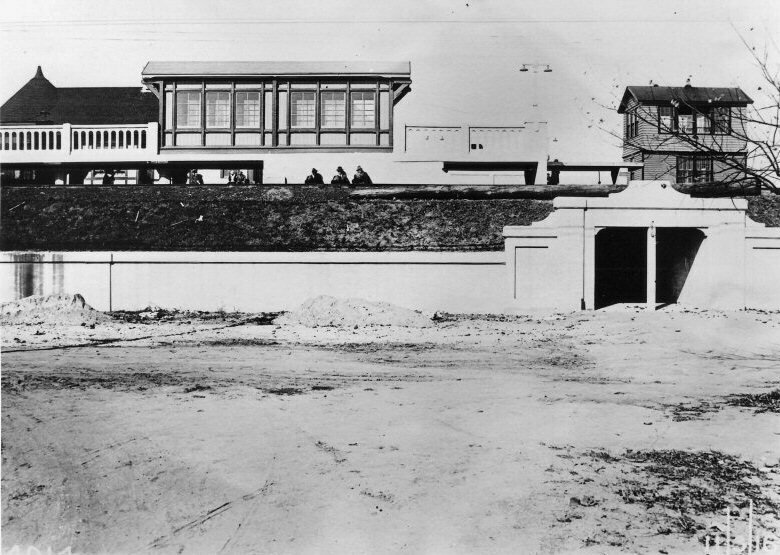 Completing Breaker House. 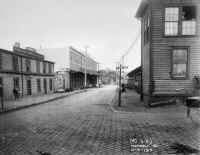 Old meat market structure at right. 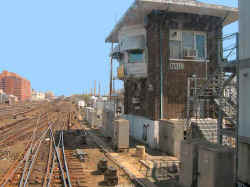 New station visible in distance. 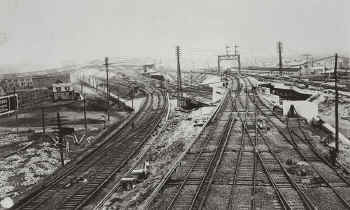 Tracks to Old Southern Road in foreground and at left in tunnel. View looking west: 7/14/14. 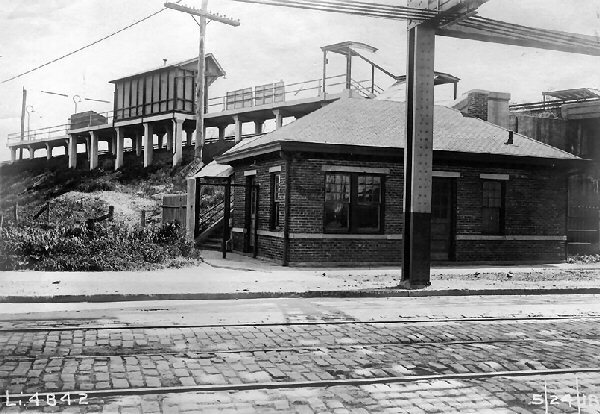 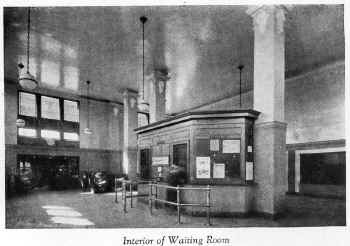 New station, general offices and platforms with Manhattan & Queens trolley car #117 in front of waiting room. 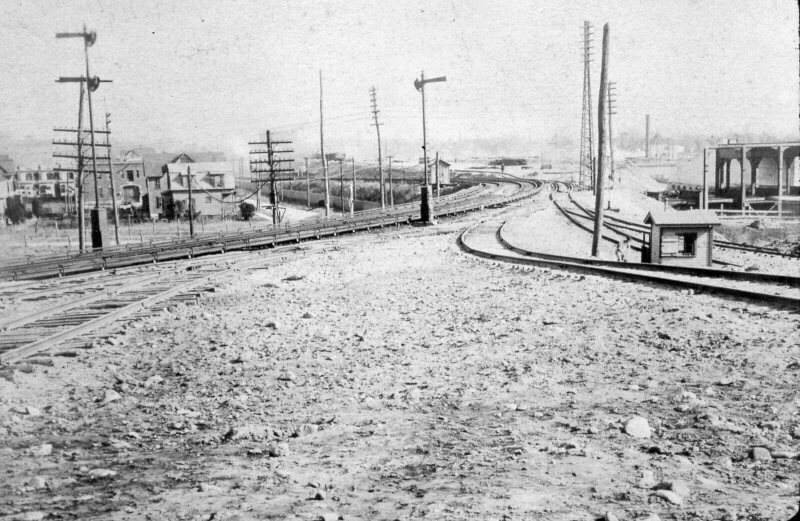 View looking west along Archer Ave. – Supply spur still in place in foreground. - 9/6/16. 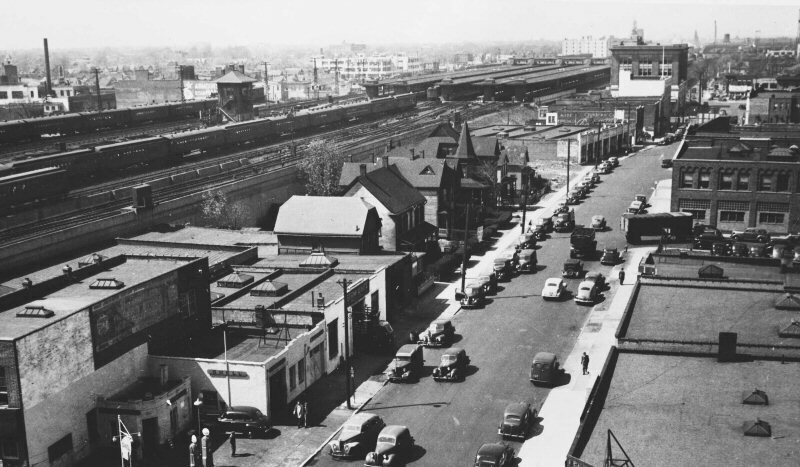 Elevated view of Jamaica terminal facilities as viewed westward along Archer Ave. from near 150th St. – c. 1938. 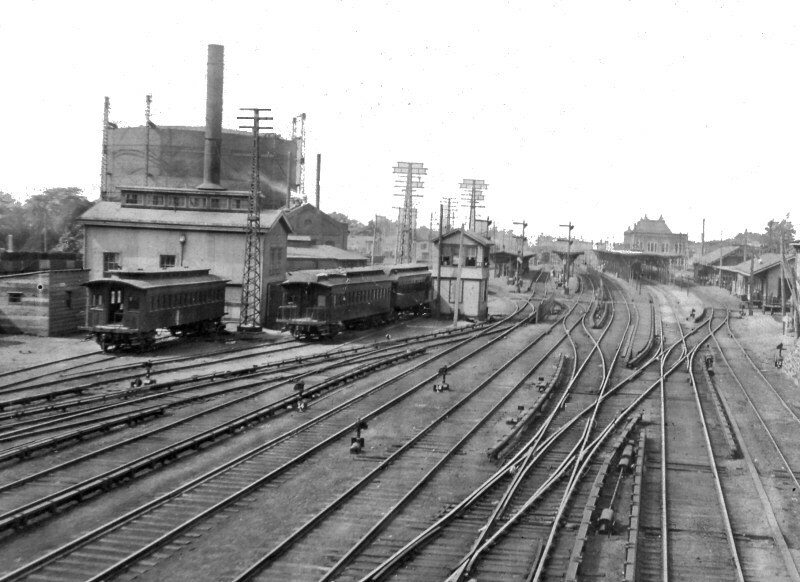 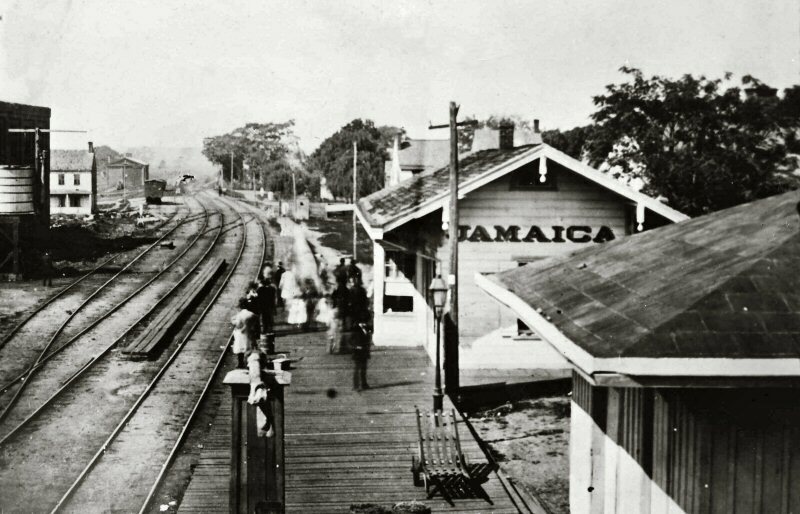 Note the signal bridge over tracks 6 and 7 as viewed in the 1913 image from “JE” tower is no longer in place at this time. This photo was shot by Henry Barsky from one of the station office building upper floors of the Jamaica station general offices. 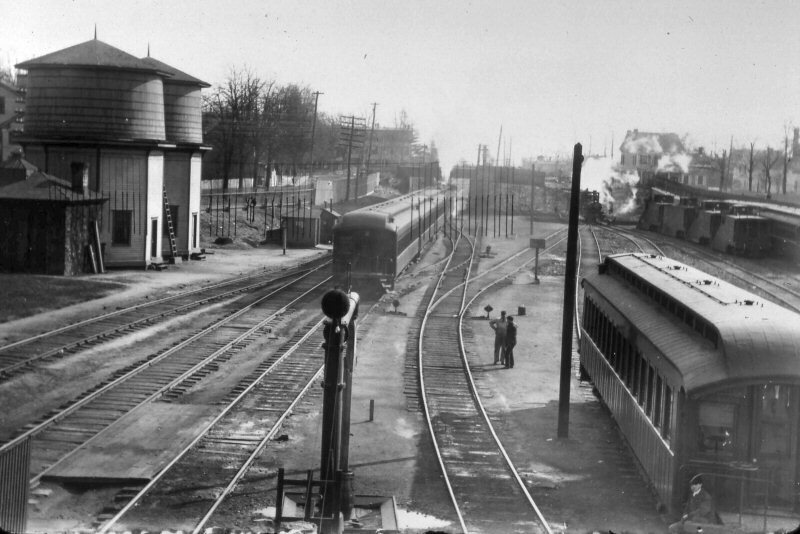 We see a train of mixed Tuscan Red and Tichy cars in the foreground. By HALL tower is a set of DD1 electric locomotives. 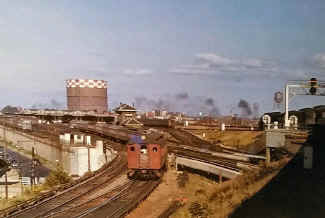 In the center background are two MU cars; one Tuscan Red and one Tichy. 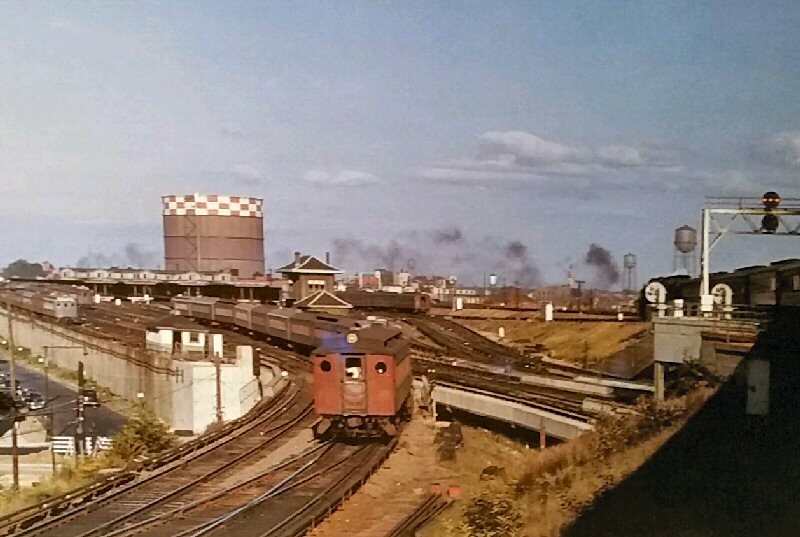 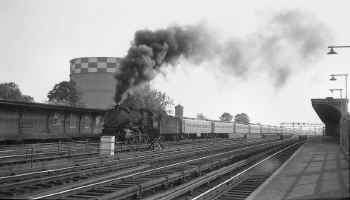 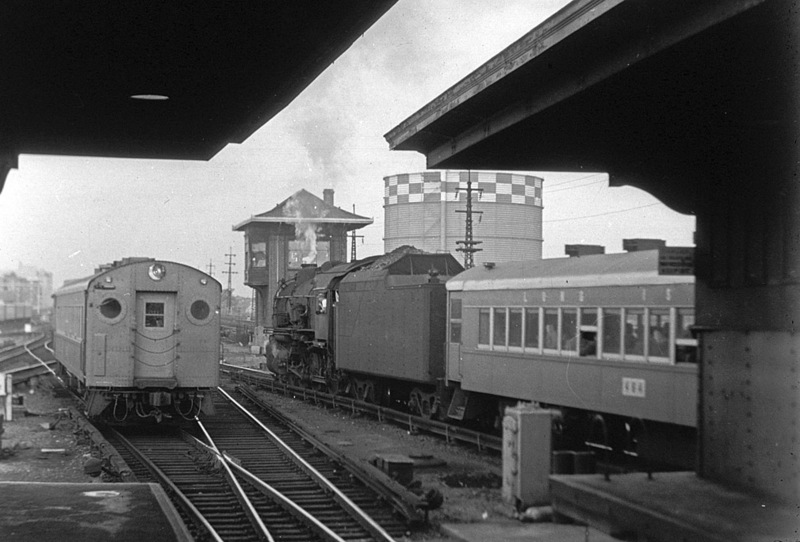 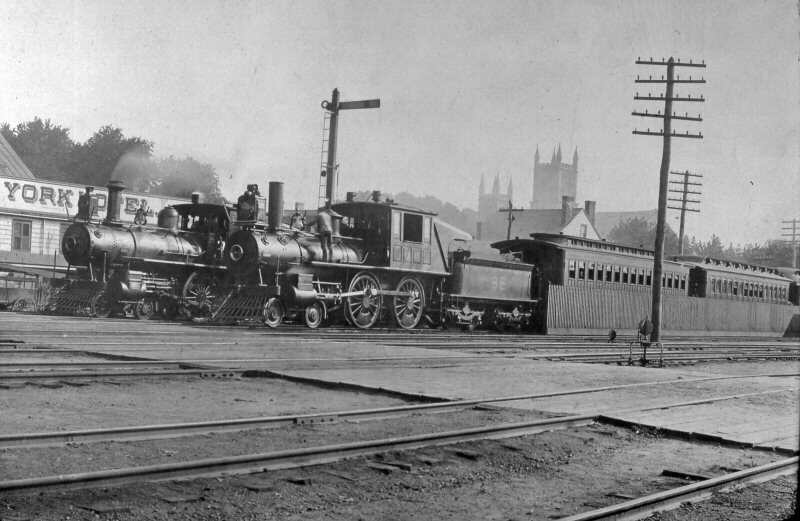 At the far left is a K4s steam locomotive heading eastbound in front of the gas tanks with a C-Liner to the left of the K4 loco. That gas holder belonged to the Brooklyn Union Gas Company. 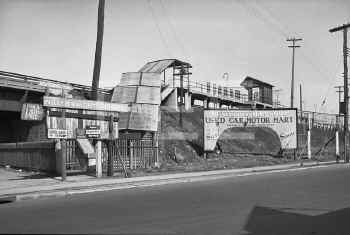 It was built somewhere around 1945-6, on a piece of land which had been the site for a gas works back around 1910 and earlier. 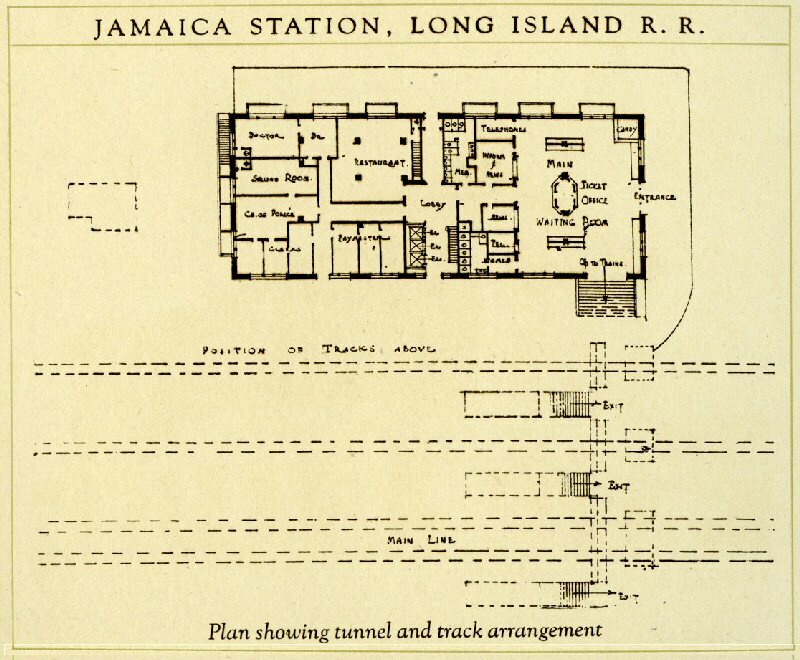 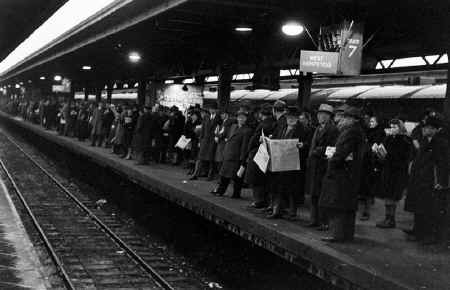 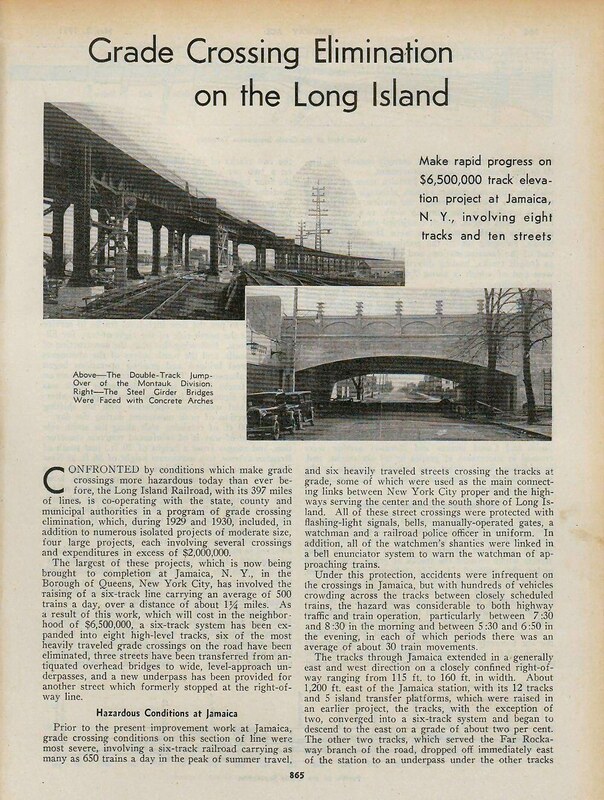 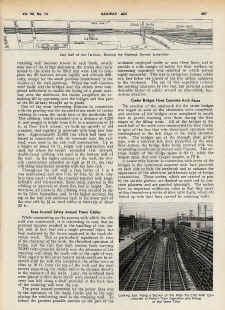 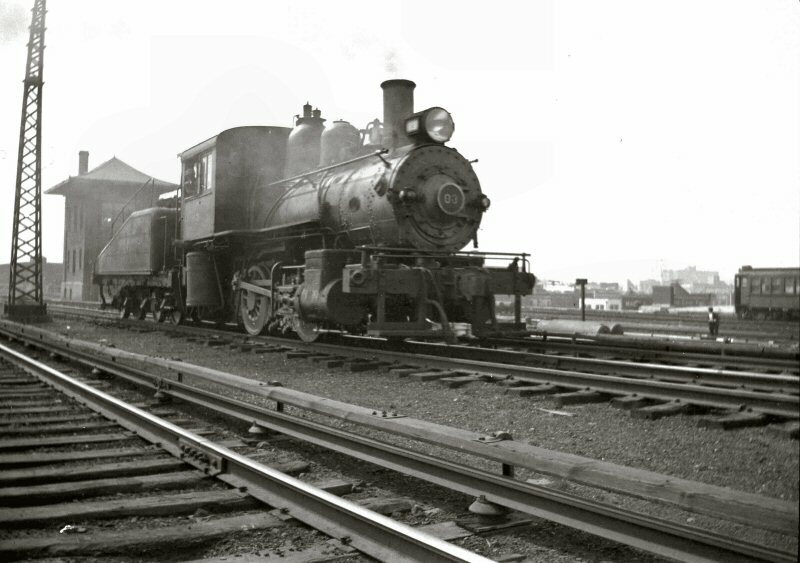 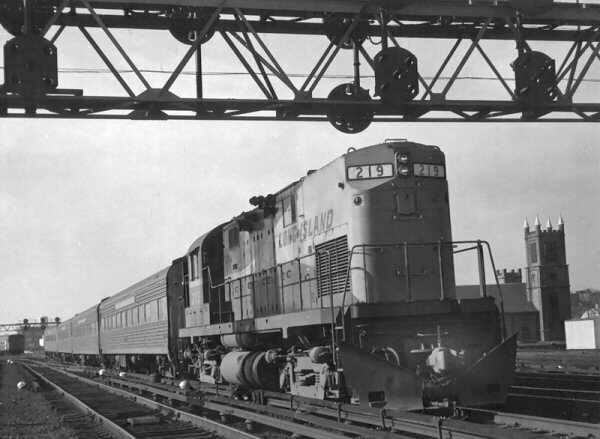 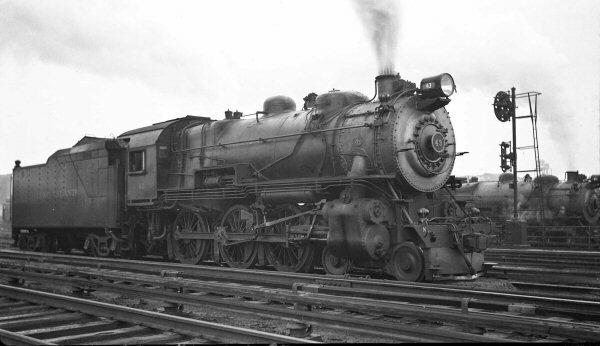 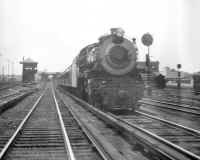 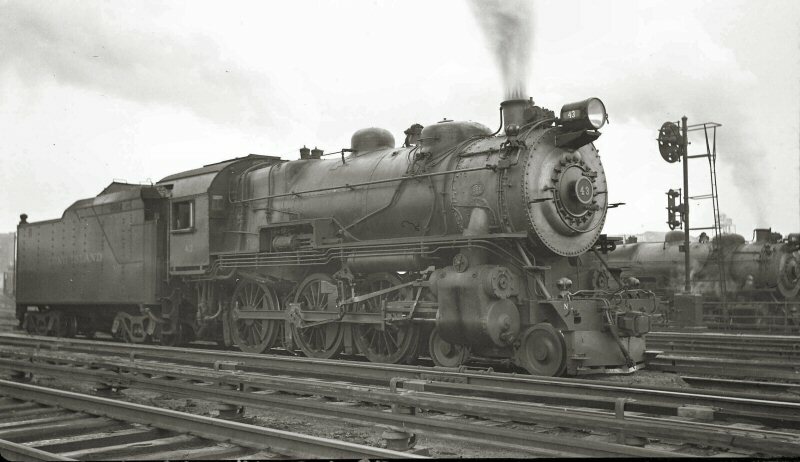 Some LIRR pictures from that era show a much smaller holder on that site, but that disappeared by the 1920’s.